NATO Secretary-General Jens Stoltenberg addresses the 63rd NATO Parliamentary Assembly in Bucharest, Romania, October 9, 2017. 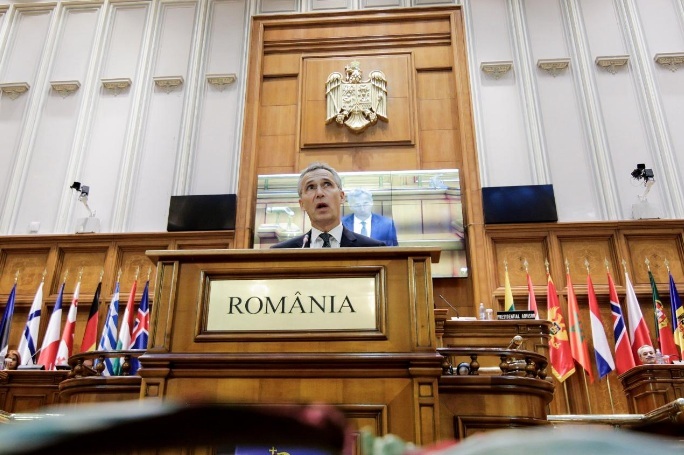 BUCHAREST - NATO launches a new multinational force in Romania on Monday in its latest step to counter Russia along its eastern flank and to check a growing Russian presence in the Black Sea following the Kremlin’s 2014 seizure of Crimea. Initially a small force relying on troops from 10 NATO countries including Italy and Canada, as well as host Romania, the land, air and sea deployments are expected to compliment some 900 U.S. troops already and separately in place throughout the country. Russia accuses NATO of trying to encircle the country and threatening stability in eastern Europe, which NATO denies. Around the Black Sea, Romania, Bulgaria and Turkey are NATO members while Georgia and Ukraine aspire to join. Details of the new force size were unclear. NATO officials said the land component of the force involves a brigade-size multinational NATO force, typically some 3,000 to 4,000 troops, but the contribution of non-Romanian troops is modest. NATO air forces will also be limited at first, but Britain is deploying fighter planes to Romania, and Canada is already patrolling Romanian air space along with national pilots. Italy is patrolling Bulgarian air space. As in the Baltics and Poland, NATO says relatively light multinational model recalls allied support for West Berlin in the 1950s, when British, French and U.S. forces ensured the Soviet Union could not control all Berlin. That drives home the commitment enshrined in NATO’s founding treaty that an attack on one ally is an attack on all, meaning all 28 NATO nations would be required to respond in the case of any potential Russian aggression. While months in planning, the establishment of the force, which NATO Secretary-General Jens Stoltenberg will visit later on Monday, comes as Russia winds down its biggest war games since 2013. NATO’s “Tailored Forward Presence” in Romania and Bulgaria marks a diplomatic success for Bucharest, which has pushed for a NATO force on its territory since the U.S.-led alliance moved some 4,000 troops to the Baltics and Poland, as well as prepositioned U.S. weaponry, early this year. Romania’s demands have gained extra weight as it is set to reach a NATO goal of spending 2 percent of economic output on defense this year, a priority for U.S. President Donald Trump. The force is also an attempt at a middle ground in NATO’s emerging deterrent strategy in the Black Sea, rich in oil and gas, to counter Russia’s own plans to create what military analysts say is a “buffer zone” in the region. Turkey has played down the extent of Russia’s militarization of Crimea, which NATO says involves an “anti-access/area denial” strategy for surrounding areas, with a laying of surface-to-air missiles and communications jamming equipment. NATO launches a new multinational force in Romania on Monday in its latest step to counter Russia along its eastern flank and to check a growing Russian presence in the Black Sea following the Kremlin’s 2014 seizure of Crimea.